2013老挝虎F15密印精制银币 Purchase this unique silver proof collectible coin, produced by the Democratic People's Republic of Laos which was part of the Fabulous 15 collection for 2013. The tiger is the largest cat on the planet, and the most endangered. It is thought that there are fewer than 3900 still living in the wild. 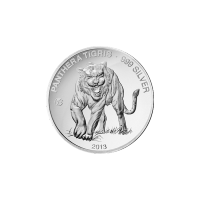 The reverse of this coin features a fierce tiger walking through grass. The detailing on the coin is wonderful, and we can almost sense the motion of the beast as it walks. Part of the coveted F15 privy mark series of coins, secure yours today!